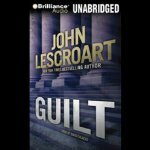 I think I’m finishing up novels of John Lescroart – the ones which are available in audio format and read by Colacci, anyway. I’m going slowly – this is comfort reading/listening. “Guilt” is a stand-alone featuring Abe Glitzky, the Black and Jewish, very married-with-children San Francisco detective. This is Dismas Hardy’s old buddy from the days Hardy was on the police force but Hardy isn’t involved in this one. In “Guilt,” the smooth, handsome, rich, powerful and very married Mark Dooher is legal counsel for the Catholic Church. The Church is in trouble due to the philandering of one of its priests. Dooer himself is apparently in some phase of pre-trouble with Christina Carrera, a beautiful and brilliant law student who does some work for an abused women’s facility and is dating Joe Avery, one of Dooer’s co-workers. Dooer wants her to come to his office as a clerk. Meanwhile, Dooer’s good friend, Wes Farrell, is in the middle of a divorce from his wife, Lydia, who is the best friend of Mark’s wife Sheila, which tangles things a bit – especially when Dooer, the managing partner of the law firm, offers Christina a job in their office. Oh there are lots of interwoven little tales here and when lawyer for the extortionist litigant against the Church turns up dead that’s one thing, but when Sheila Dooer is found dead with a bayonet stuck through her, that’s another. Typical Lescroart – I love it – page-turning comfort listening.